It’s not unusual to go into the NBA playoffs expecting the unexpected. The postseason is supposed to bring out the best in the game’s preeminent players; anything less would be disappointing. But common sense suggests that heroics won’t take place in bunches. That doesn’t mean the incredible won’t arise — we’re just used to being able catch our breath in between magical moments. After all, this isn’t the NCAA tournament, when each game manages to outshine the one that came before it. This is the NBA postseason, and clutch performances are meant to be spread out. Except, this past weekend they weren’t — they came one after the other. And we’d be remiss not to draw attention to this latest bit of insanity. For those unfamiliar with the term “hero ball,” it refers to instances in basketball when the offense breaks down and everything becomes an isolation play. Some feel that this takes away from how the game is meant to be played, when one player comes to the forefront and the team-oriented basketball takes a backseat. We can see that. In fact, we often feel the same way. But sometimes, events unfold that force you to reexamine previous thinking. That’s what happened this past weekend. Hero ball did exactly what it should: It produced heroes. 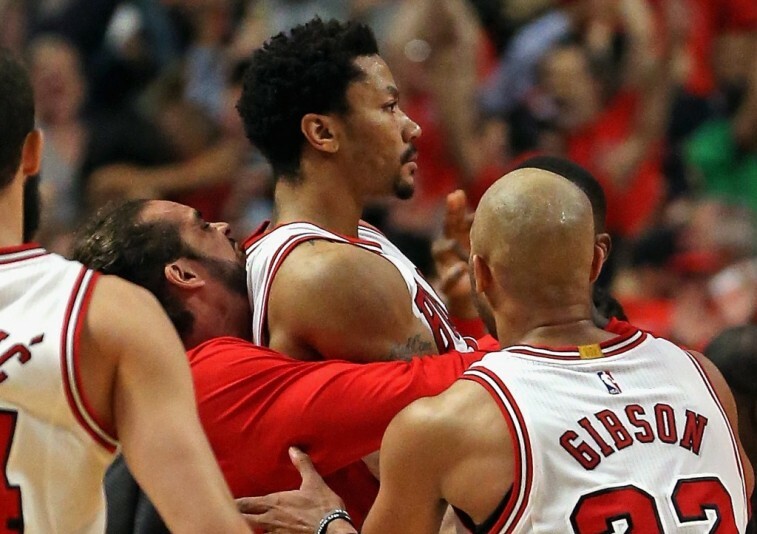 There may be no player in the NBA who deserved a moment of heroism more than Chicago Bull Derrick Rose. In a time when we psychoanalyze every minute detail, this young guard is consistently under the microscope. We debate whether he’s lost his explosiveness, or if any bursts can last. We say he should give up stardom, that he’s no longer go-to scorer on his own team. But if you’ve been watching this second-round series with the Cleveland Cavaliers, you’d see that he’s elevated his game to a new level — 25 points, 5.3 rebounds, and 6.5 assists per game. And yet, despite his production, D-Rose still needed that moment. That moment that says: I’m not going anywhere. Friday night’s Game 3 saw that happen, and it was uplifting. When Rose’s buzzer-beating three pointer banked in to give the Bulls the 99-96 victory, everyone who saw it knew that this was a monumental moment. No player in the NBA has dealt with the amount of setbacks that Rose has. This single play had to feel like validation — like all the hard work was worth it. The Bulls might win this season, or they might not, but D-Rose has purged some of his demons. In one fell swoop, we were reminded of what this guy can bring to the game. Hero ball never looked so sweet. Of course, that was until Saturday’s contest between the Washington Wizards and Atlanta Hawks brought out the truth. The Washington Wizards are supposed to be done for. Without John Wall in the lineup, this team is supposed to buckle and bow out gracefully to the East’s No. 1 seed. But that doesn’t work for Paul Pierce. Despite the Wizards squandering a 21-point Game 3 lead, Pierce would do his thing and bury the Hawks on a fadeaway jumper as time expired. Two days. Two buzzer beaters. Two heroic moments. What more could we ask for? How about three? Entering Sunday’s Game 4, LeBron James knew that he had to come up big if the Cavaliers hoped to avoid going down 3-1 in the series. Cleveland is a talented bunch, but it’s a team that’s currently lacking the usual firepower. It’s in situations like this that the King tends to step up his game. And step up he did. With 1.5 seconds left in the contest, James caught an inbounds pass on the left side and splashed a fallaway jumper as time expired. Game over. Cavs win, 86-84. The drama continues. What’s interesting about this situation is that it almost never happened. Initially, ‘Bron was meant to pass the ball in. But was he really going to give up this moment? “To be honest, the play that was drawn up, I scratched it,” James said. “I told coach, ‘Just get me the ball. We’re either going to go into overtime, or I’m going to win it for us.’ It was that simple.” And that’s what he did. James won the game and capped off an incredible weekend of basketball. There are times when the use of hero ball takes away from the team aspect of basketball. But sometimes, it’s important to look at these instances from a different angle. Sometimes, these situations are merely moments when the hero wants to the ball. This happened a lot this past weekend, and we may never see anything like it again. We should’ve known better. It’s the NBA playoffs; expect the unexpected.